We all have our own respective religions right? We all have our own God’s we worship right? But what would you say if there is another unknown God out there or should I say someone that wants’ to play God that is progressively wanting to change this wonderful and beautiful planet into what one could only say is a sort of ‘Hell on Earth’ and has Facebook Clergy doing his bidding ? Would you then do a double take and listen? All pictures on this blog are from Oublic Facebook Groups and are the intellectual property of False Prophets Exposed. What a load of Tosh, codswallop and hogwash from the lying ‘sociopath’ at the International Congregation of freeloading asswipes. 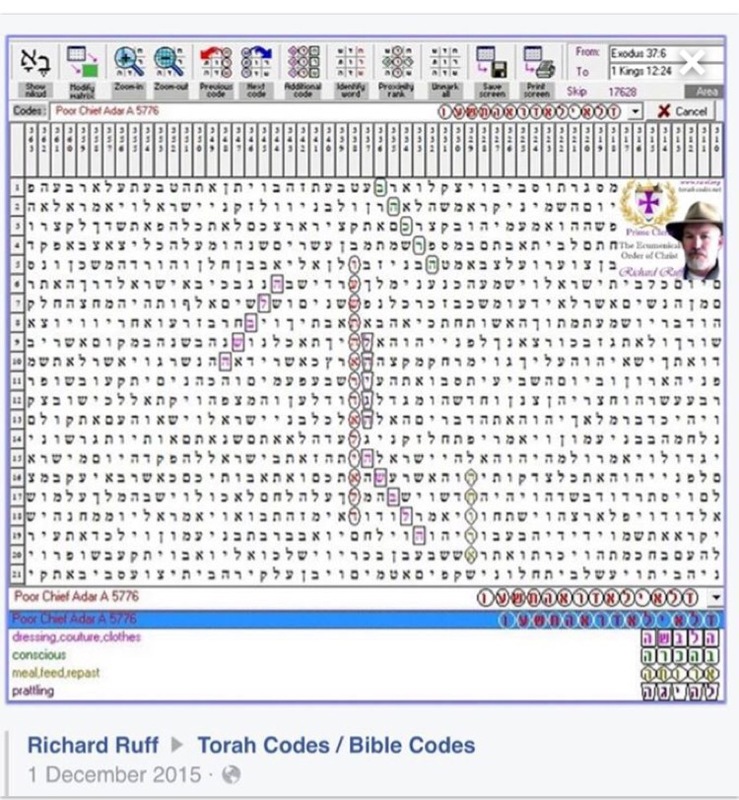 The prattling Richard RUFF who coincidently thinks he is Moses states in HIS Torah code (1Dec) that the head clergy (himself) hasn’t got any money THIS month and that they NEED to get to Israel for the last battle. SO SEND MONEY … Or purchase their merchandise via the online store. 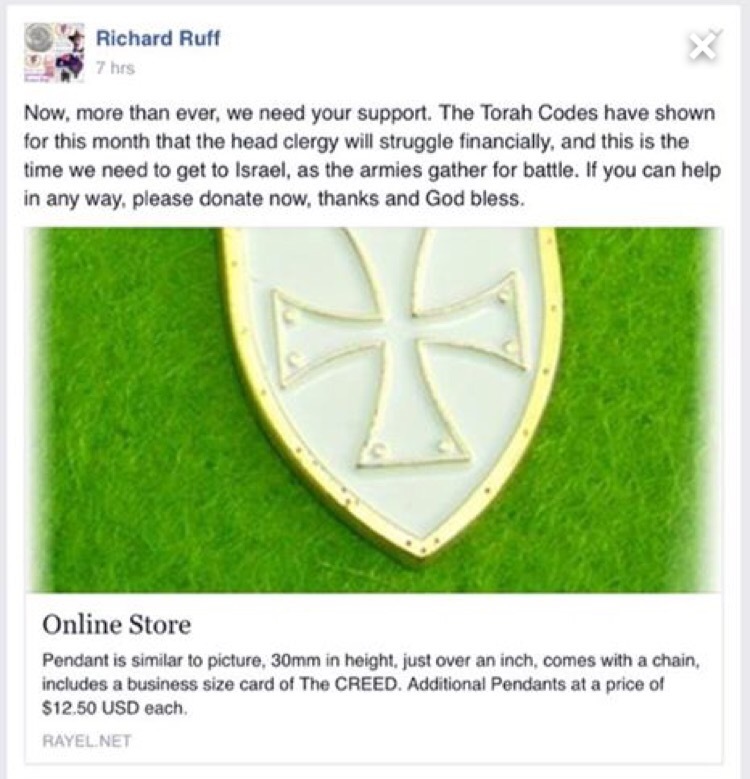 Indeed those who wish to dangle cheap tat made in China emblazoned with a Templars cross round their necks are more than likely the same breed of infidels that purchase non-descriptive Torah Codes that resemble Crossword Puzzles conjured Leprechauns. One would be negligent to point out the obvious. Take a look at this, apparently an authentic Torah code. But the intellectually curious reader should also look at what is written. From the Torah’s perspective, Adar is the last month of the Hebrew calendar. Adar is the Jewish month of good fortune. In fact, Purim is the most joyful time of the entire year. “When Adar arrives, we increase our joy,” say the Sages. It was also the time when Moses died. Where does it say that CLERGY require money ? This is fabricated code, by a pathological liar, and this cauterised mindset is their way of life. Scamming ! And he does it without the slightest compunction. Whilst Richard Ruff is growling for money the Baja sect are releasing their Armageddon news broadcast channel which should be ‘enlightening’ one of their ‘Knights’ 😳 equally disturbing is threatening one of the team with supernatural demonic forces. B) Wish for the deaths of countless human beings that do not believe in their pathetic crusade. When you consider that the populous of the world is a caring, loving and compassionate individuals you really have to contemplate their motives. You either conform or die, (before though you need to give them all of your worldly goods and souls because you will not need them. In fact, they’re so recklessly pursuing their megalomaniacal plan they don’t care what humanity morphs into, as long as it’s shrunken to a manageable half billion dumbed-down fully controllable droids. I doubt very much that this weasel would know “poor” if it jumped up and slapped him on his forehead.